This Year’s Christmas Letter…PLUS a free holiday music video for the first 10,000 visitors! Enjoy this year’s letter! Last year, you may recall, the letter was h; but, there was no music. This year is different. Thanks for visiting, and all the very best to you, your family, and loved ones! 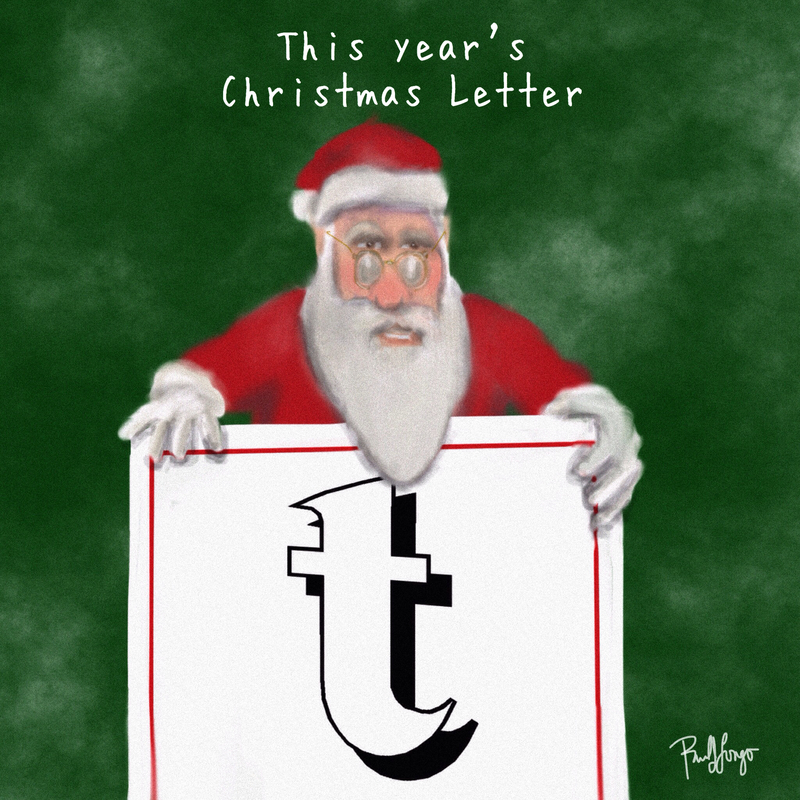 This entry was posted in Digital Artwork, iPad Art, music, Sketches, Video and tagged annual Christmas letter, Christmas, Christmas cards, Christmas Lights, Christmas Tree, Merry Christmas, Phonto, Procreate, the letter t, Videoshop by portfoliolongo.com. Bookmark the permalink. that was very very nice ! nice guitar too, beautiful tone. you are always surprising.wishing you and Anne the best ever Christmas and happy new year my friend. Thanks for visiting and for your kind words, Janine. Very much appreciated! Bravo! That was definitely worth the wait. We camped overnight to ensure we would be among the first 10K visitors. Merry Christmas Paul and Anne. Thanks Don! Say hey to Nancy…and Merry Christmas too! Hey, was that yinz in the blue tent? I preferred last year H.
You made me smile 🙂 …a charming and amusing post. Such delightful music! Sitting on the couch, and listening and watching you play, created a lovely restful interlude…funny word…after along hot summer’s day here. Wishing you and your wife a Merry Christmas and a Happy New Year… Looking forward in the new year – and before, if you post before then 🙂 – to more of your wonderful art and music! All the best, Janette.